Our location at 1510 S. George St is where the magic happens! When we buy cars, each one is inspected and repaired at service here at The Service Center York before customers can test them. The incredibly experienced and friendly Sunshine Motors team is here to help however we can. Our Buy Here Lease Here program is well renowned and includes a maintenance plan, and warranties on all vehicles. Make arrangements to pay weekly, bi-weekly, or monthly depending on your financial situation and we will help you find the right car for what you need. We offer a convenient online payment center, pay via credit card over the phone, or you can bring cash in to any of our locations. 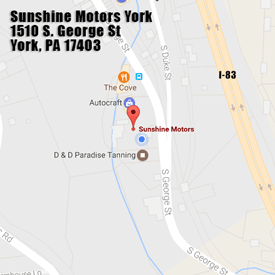 Learn more about the Buy Here Lease Here York PA program here! Once a ballet dancer and girl scout, Kelly is now the woman that will hunt you down if you fall behind on your car payments. After being robbed three times in six months working as a lead bank teller for a decade, Kelly left the banking world behind to work at a cigar shop on the beach in Delaware for 7 years! Sunshine Motors welcomed Kelly 5 years ago when she came back to York and is now the friendly face you see when you walk into Sunshine Motors York. Kelly likes working at Sunshine Motors because every day is different and the Sunshine team is great to work with. Nick began his career as a professional skateboarder and assisted the development of the now renowned Camp Woodward. His extreme sports career came to an end due to a shoulder injury, however, Nick still remains friends with Gary Ream and Tony Hawk. After his injury, Nick was tasked to establish the Buy Here Pay Here program for Griffith Honda in York and then expanded the program to two other locations in Maryland. As the Buy Here Pay Here business grew, Nick opened and acted as General Manager for several businesses in York and Surrounding Areas before opening Sunshine Motors. Nick still enjoys skateboarding as well as golfing and playing the bass and guitar in his band “Single Hitter!” He likes working at Sunshine Motors because he enjoys taking care of his customers and the Sunshine Motors team. Located just off of 83 and just miles from downtown York, we’ve been serving the York community of over 5 years! Check out our Inventory to see our newest arrivals and contact us today to test drive our cars.